Shop Nady SP9 Dynamic Vocal Microphone With Clip from AMS and enjoy Fast & Free Shipping. The Nady SP9 Dynamic Vocal Microphone is the ideal all-purpose vocal and instrument microprhone. Linear response for detailed, natural sound across the spectrum and unique one-piece molded cartridge design ensures superior immunity to abuse and shock. This Nady SP9 Dynamic Vocal Microphone features a cardioid pattern via an alnico magnet resulting in excellent feedback immunity and low handling noise. 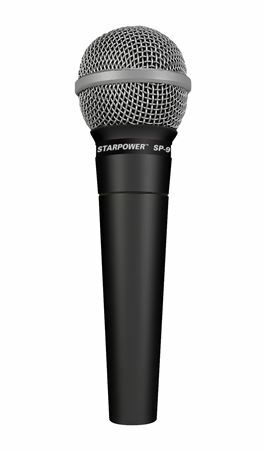 A rugged and reliable microphone perfect for stage usage. The sound is great. Not a bad price for the good quality mic. Other users and I are very impressed with the sound and build quality of these mics. We use these primarily for vocals at various type music get-togethers. .
Can’t complain about this mic and the price. Great mic for the price! Works perfectly for what I needed. Use it at rehearsal for vocals and no feedback! These work just fine for micing my drums. Worth the price. Well worth the price. Plus got a 2nd one free during a sale. Works great for me. Use it for band practice. I host karaoke, so I'm always looking for sturdy-yet-inexpensive microphones. I caught a two-for-tuesday sale on these, so figured I'd roll the dice and see if the Nady SP9 could work for me. My first impression when they arrived was positive: they look decent and the weight is good. In an initial, isolated test, I was impressed by the lack of handling noise, but was concerned by the bassiness and plosives. In a real-world live karaoke show, I'd give these mics a C-, maybe a D overall. They're tricky to EQ and you get lots of breath and plosives while people are singing. I don't feel TOO bad about keeping these around as emergency backups since I spent less than $10 per mic, but I definitely won't look to buy any more. I haven't had a chance to use this mic too much yet, but it definitely fits the role.